Here it is! 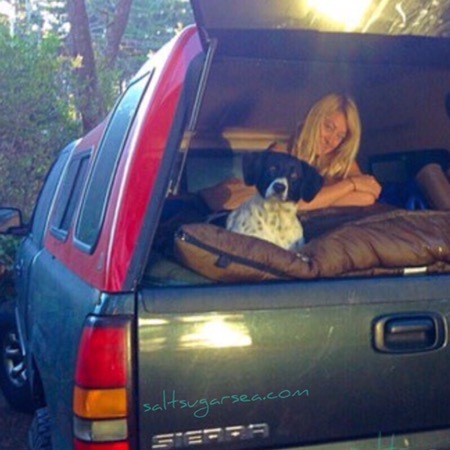 The simple DIY carpet kit that took 2 people and a dog, on the road, for 67 days, from Texas to California to Oregon, and back. You think you don’t need a bed when you’re road tripping? Well, you do. Not only does this make it extremely easy to rest just about anywhere, but you will save so much money, you’ll be able to travel longer, and see more places. So, you’re living on the road, eh? If you have a truck, you need a carpet kit! Parking in front of someone’s house, or on a side street, or an empty parking lot, to catch some sleep may draw some unwanted attention your way. It makes you appear just a little shifty, and people tend to get uneasy about that. Not to worry though, simple fix. Just make it so they can’t see you sleeping in front of their house. Everyone wins. But how can this be done, you may ask. You’ll need a camper, some window tint, and a simple diy carpet kit. I recommend checking out the used market for one of these. We scored ours on craigslist for $300. Yes it’s red, and our truck is not, but that doesn’t hinder its functionality by any means. Not just any window tint, we need total blackout. Yes, that’s right, limo tint. A local shop quoted us $250 to tint our camper shell, but we asked if they had a better price for cash, and it saved us $50. Always ask, it’ll come out in you’re favor more times then you’d think. Now that no one can see in, you might as well put a bed in there, and organize all your stuff! What kind of stuff should you organize? Less is always more when you are on the move, but here’s a good list to get your wheels turning on what you may need, 12 Packing Essentials for long road trips. Have a van? Oh, you are serious about this road tripping life! So are we. Check out this DIY idea for building a headboard and nightstand as an addition to your bed frame. Thanks for following our scenic route!